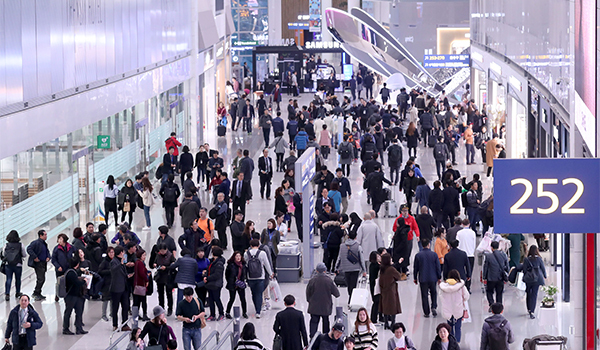 South Korea’s passenger air traffic hit the largest-ever 117.53 million passengers on robust demand for overseas travel and diversified international routes by low-cost carriers. According to the Ministry of Land, Infrastructure and Transport on Sunday, airlines carried a total of 117.53 million passengers in and out of the country last year, up 7.5 percent from the previous year. The figure is a historic high for a year. International air traffic jumped 11.7 percent on year to 85.93 million passengers, of which 39.3 percent were carried by the country’s two full-service airlines Korean Air Lines and Asiana Airlines, 29.2 percent by budget carriers, and 31.5 percent by foreign national flag carriers. Overseas air traffic via LLCs steadily expanded from 11.5 percent in 2014 to 14.6 percent in 2015, 19.6 percent in 2016, and 26.4 percent in 2017. The share is expected to exceed 30 percent of total international traffic this year as LLCs increase mid-to-long haul flights. Passengers traveling on Chinese routes last year jumped 15.6 percent on year to 16.11 million, recovering to the level before Beijing’s ban on group tours to Korea in retaliation against Seoul’s installation of a U.S. anti-missile shield system. Air traffic on European routes gained 12.9 percent during the period, Japanese routes 12.1 percent and Southeast Asian routes 12 percent. Domestic air traffic, however, fell 2.5 percent for the first time in eight years to reach 31.6 million. Meanwhile, air freight traffic added 2.8 percent to a record high of 4.44 million tonnes thanks to a surge in demand for air travel and transportation of semiconductors, machinery and petroleum products.